Alas, I am having no end of trouble with getting new contacts: my eye appointment isn't for nearly two months. I am Not Pleased. It means you'll be seeing a lot more of my spectacles, which I wouldn't mind so much if they weren't slightly crooked and always sliding down my nose or tilting sideways and giving me brow-furrowing headaches. Also it is about to be Autumn: and how am I supposed to float about in black lace gothic novel heroine outfits with horn-rimmed spectacles on?! I am hoping that something miraculous can be worked out sooner than expected. But anyway: today it is not remotely autumnal -- in fact a bit humid -- and I am keeping comfortable in cosy favourites. The shirt I will forever think of as my Willow Rosenberg shirt; I grabbed it immediately because it reminded me so much of things Willow wears on Buffy the Vampire Slayer, especially around season four. Plus it is pretty, quirky, and soft, and I love the pointed hem. 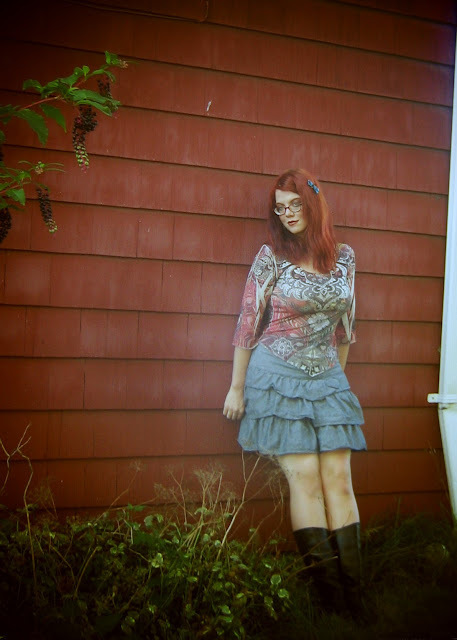 The skirt was a clearance-rack snag a month or so ago, as I'd been looking everywhere for a simple, pretty, solid-coloured short skirt I could wear with t-shirts and things. 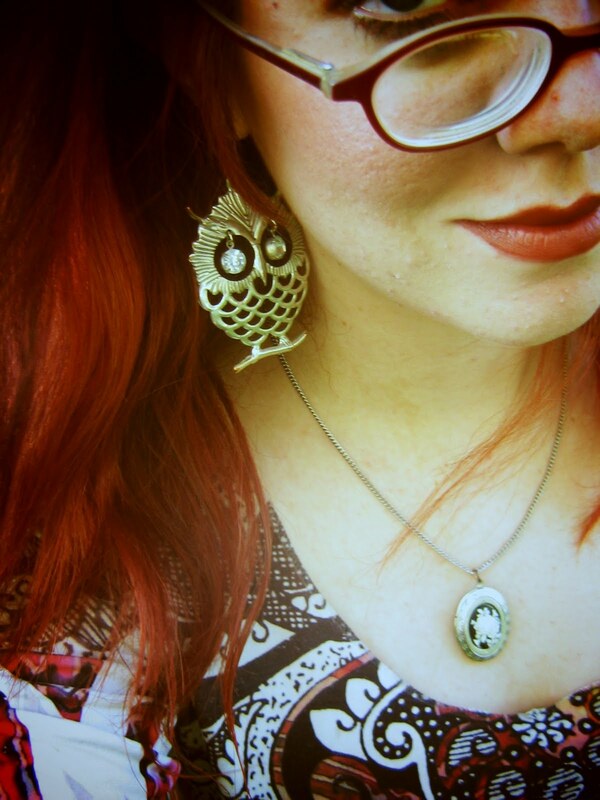 Awesome owl earrings are awesome, yes. I'm not usually drawn to gigantic earrings, but: they are owls! And they were a dollar (!!! ), and are not very heavy, and make a pleasing soft jingling when I move my head, like personal windchimes. 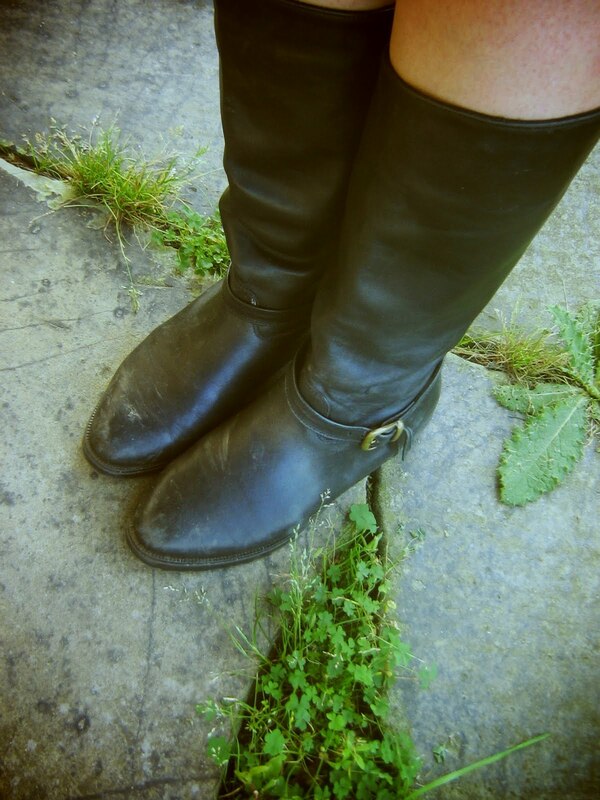 And my boots! They are L.L. Bean, and very sturdy and comfortable as well as being appealing in a sort of 20th-century British novel heroine way. Also waterproof, which is important, as the last time I was confronted by copious rain and mud, I walked about in high-heeled goth boots, having nothing better. I think you rock the heck out of the spectacles, just sayin'.